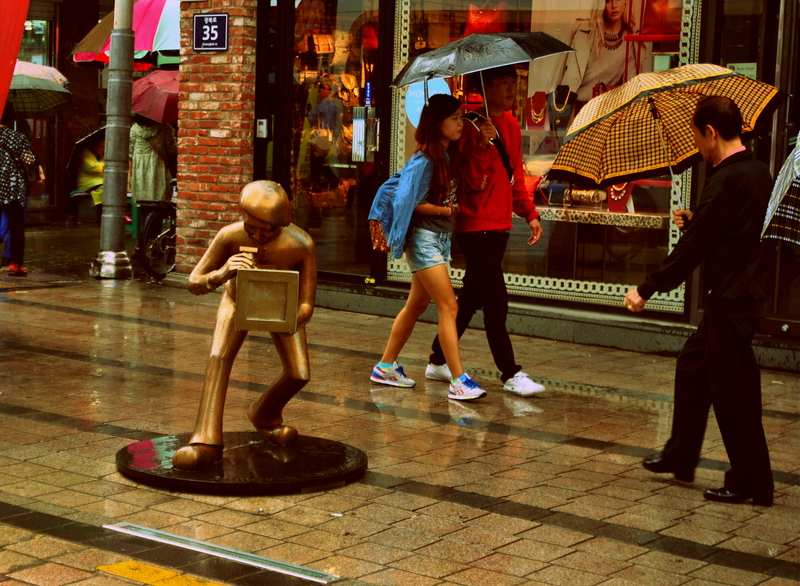 It was a spontaneous and a slightly desperate decision to get out of Seoul. Tho and a half hours on a fast train and you are in Busan. As it sometimes happens, I went without too much knowledge of what to do and just one print out with top 10 attractions in the city, thinking that information will be easy to find. 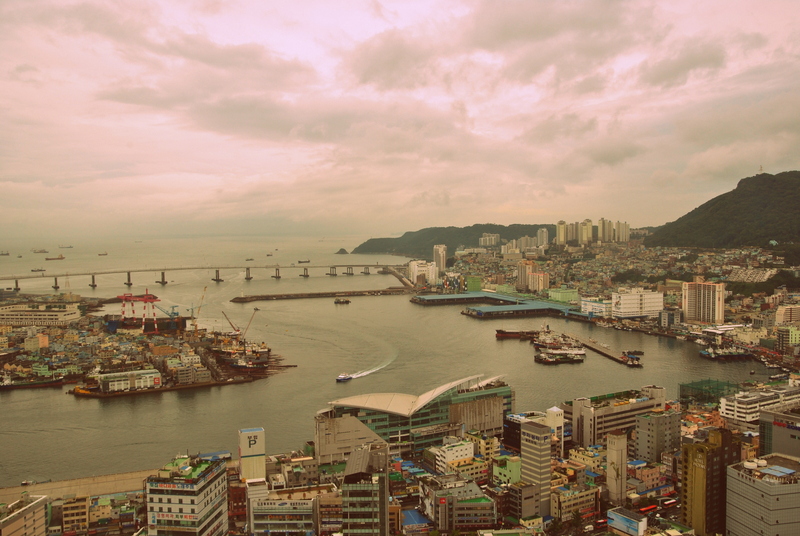 When I arrived at Busan Central, the city greeted me with a good dose of rain and grayness. At first glance the city comes across as being a little if not rundown, then being stuck in the 80-90s. 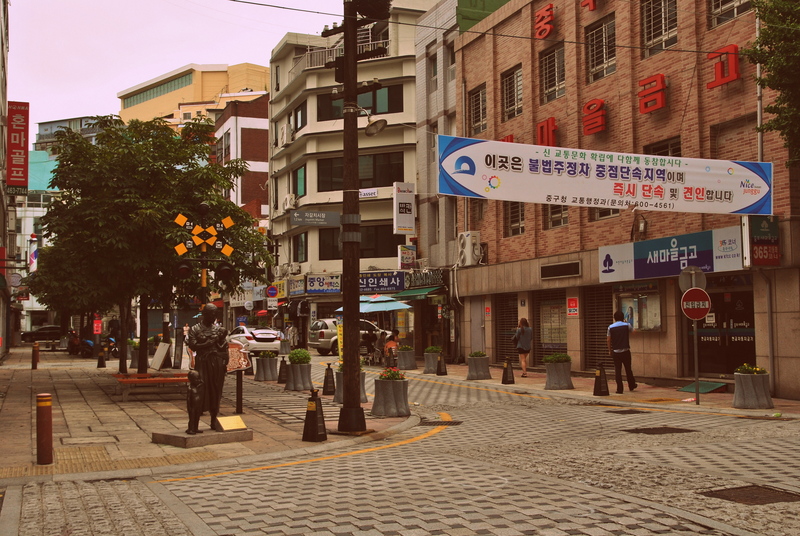 Sad looking subway stations past the main hub, funny decor and lots of ajumas!! But a few hours later, the weather improved, I find a few things to do and left in great spirit. 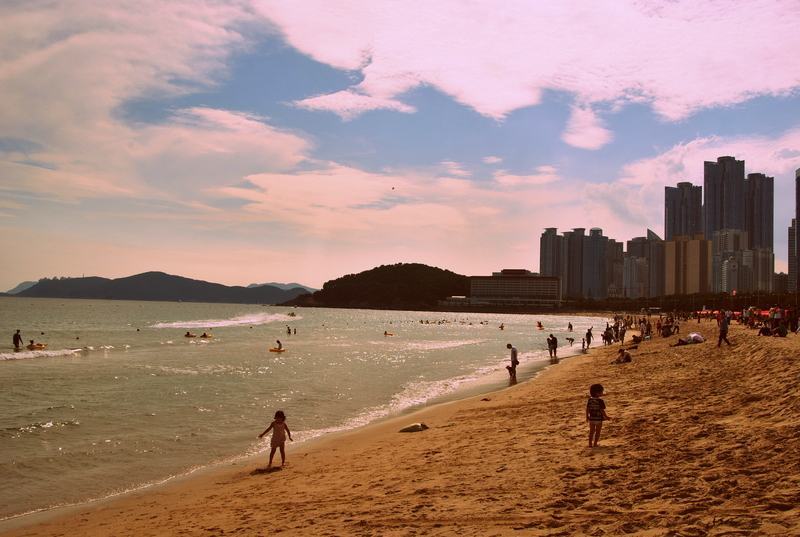 You can say that the city is divided into two areas – Busan central and the beach district (Haeundae Beach). It takes about 40-50 mins to get from one area to another on local subway. 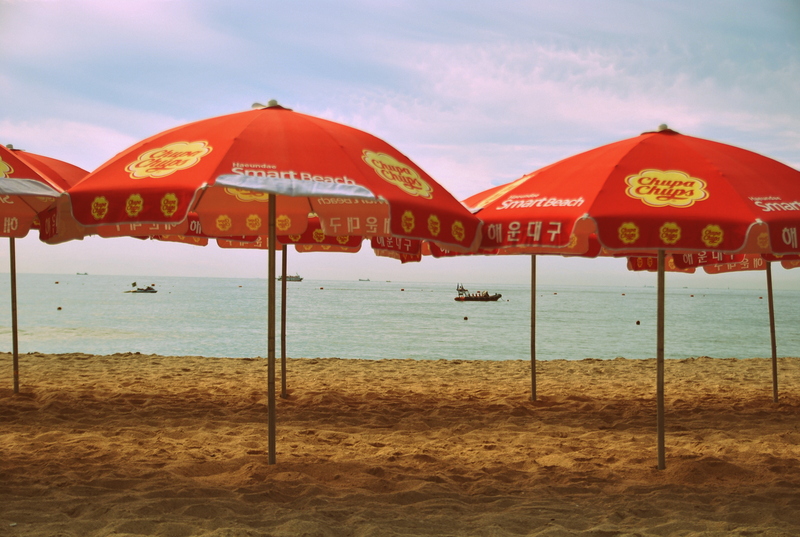 When the weather is nice, it is definitely better to stay in the beachy area and take a trip to the city center). It is a stunning beach, despite some high rise building on the background. I hear it gets quite busy in summer, but in early September it was lovely. 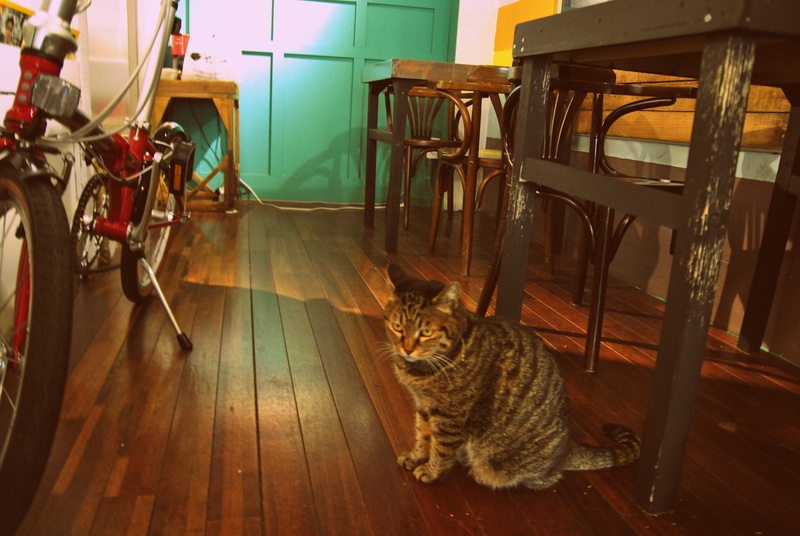 Lots of cafes and restaurants and it definitely feels like a laid back place. 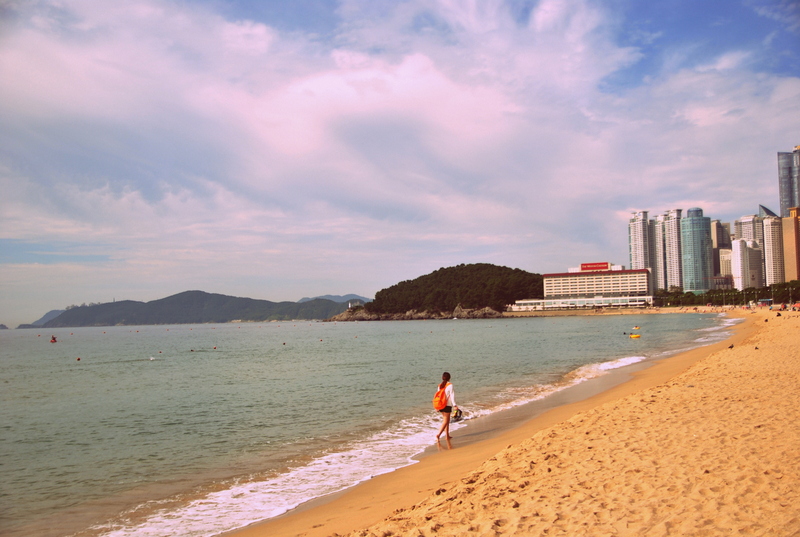 If the weather isn’t so nice, it pays to stay in the central area, since there is more to do there on a rainy day and go to Haeundae Beach just for a bit while visiting other attractions nearby. 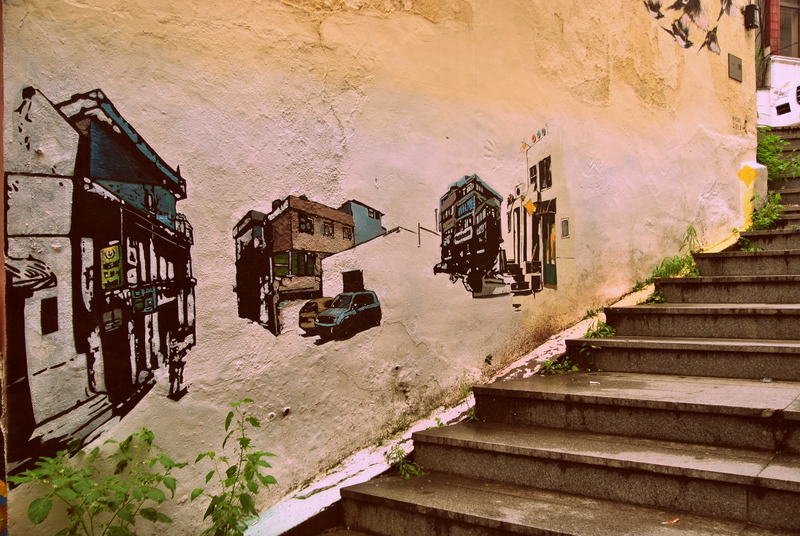 The most well known attraction is the 40ty steps. 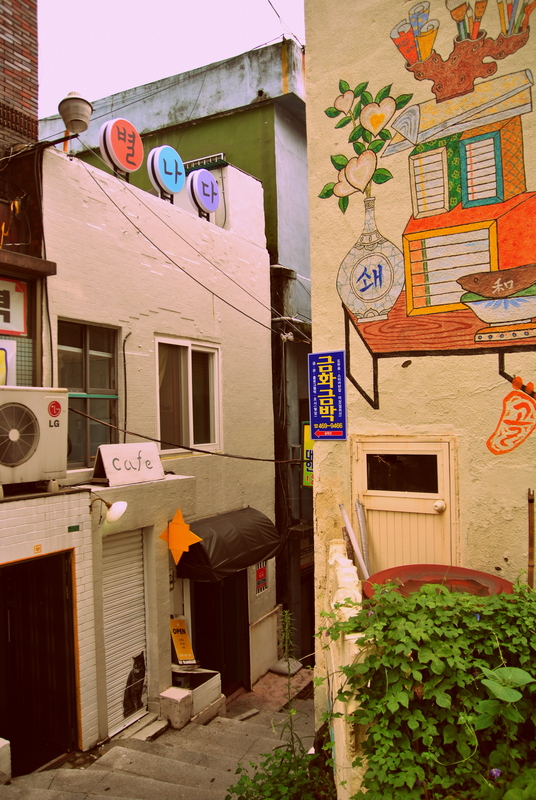 A place where locals came to relax and exchange food during the Korean war. It has subsequently been re-built to accommodate larger number of pedestrians, but the original is also still there. 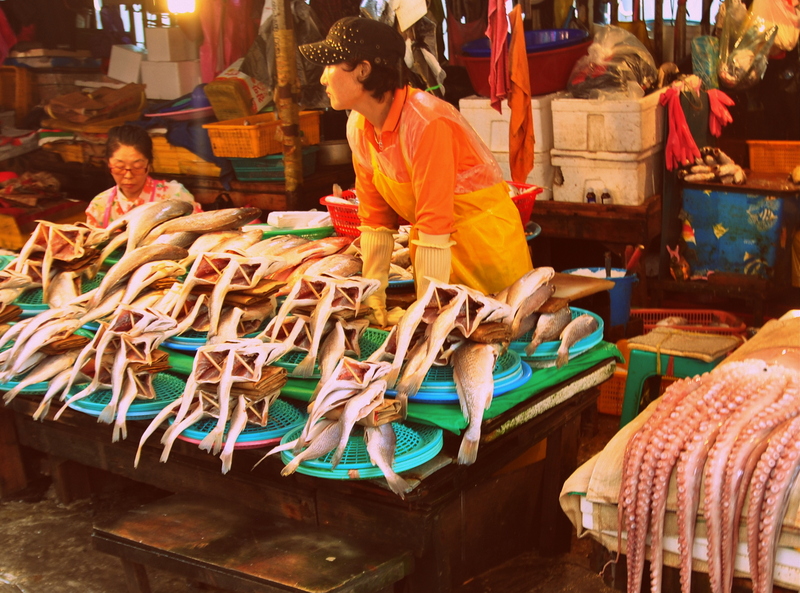 The biggest market of fresh fish in Asia is located on the waterfront, adjacent to the subway station bearing the same name. Slightly amusing, as fish is being scaled and cleaned in front of you. There is no smell, but when I went there, it was raining and a risk of being poked in the eye by an umbrella was unusually high. Narrow walkways and lots of old ladies walking veeeery slowly were the driving force behind it. I also made a biiig mistake by wearing open sandals. Suitable for the rest of the city, it was not a great idea to walk over fish guts and scales. I ran away without trying any local fish dishes. Here is a pic of my friend. 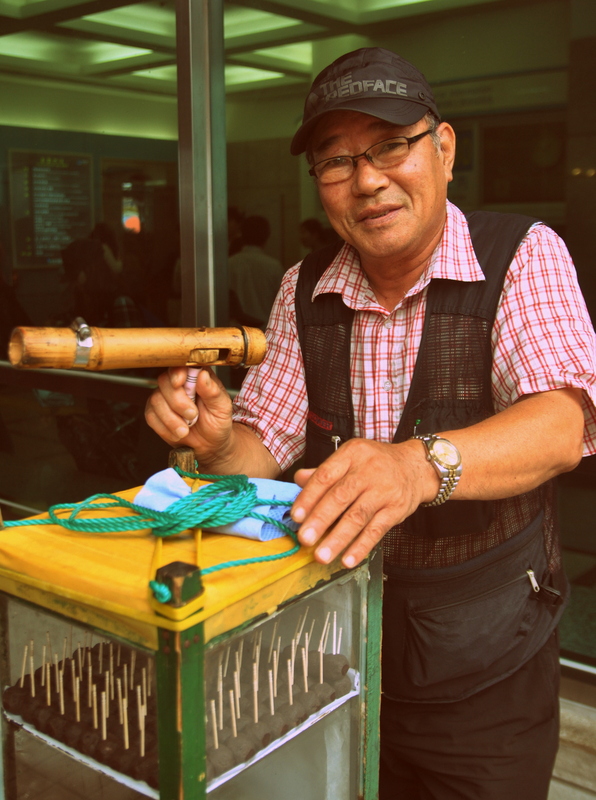 According to him, he’s been selling rice cakes at this spot for over 40 years! Yes it has seen better days, and some parts of the tower look a bit tired, but the view from the top is pretty good. 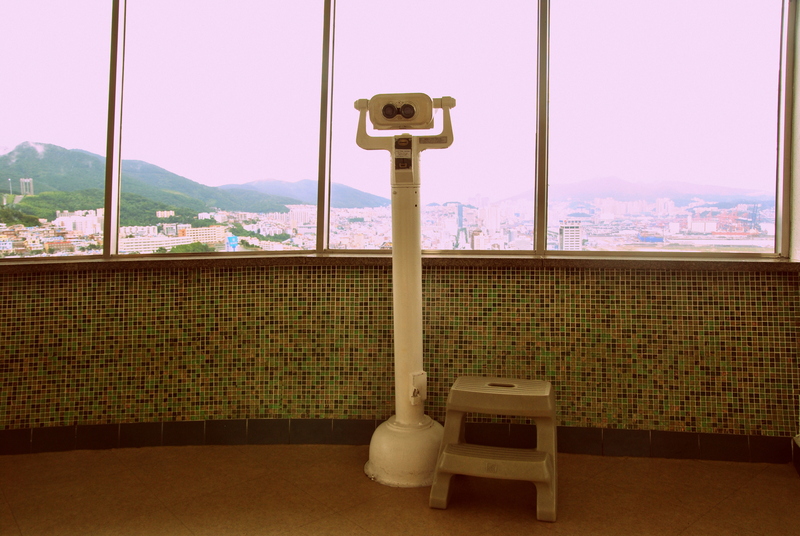 It costs 6,000 won to go up, and there is a panorama view covering most of the city. Even on cloudy days you can see the ocean, port and central city. The tower is surrounded by a small, but cute park with lots of tree and benches if you need a break. 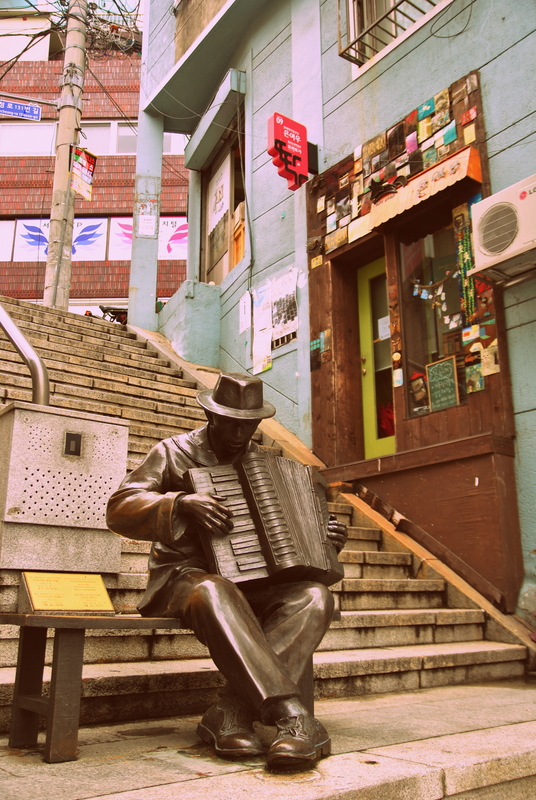 There is nothing crazy beautiful there, but you can go for a stroll along the main street, looking at the funny sculptures and also hand prints of the famous Korean actors. There are lots of shops and cafes, so it looked like good area, especially in the evening. BIFF is a big thing here and the festival attracts lots of good films and good people too. Take a stroll along the beach, or just have a seat and look at listen to the ocean. 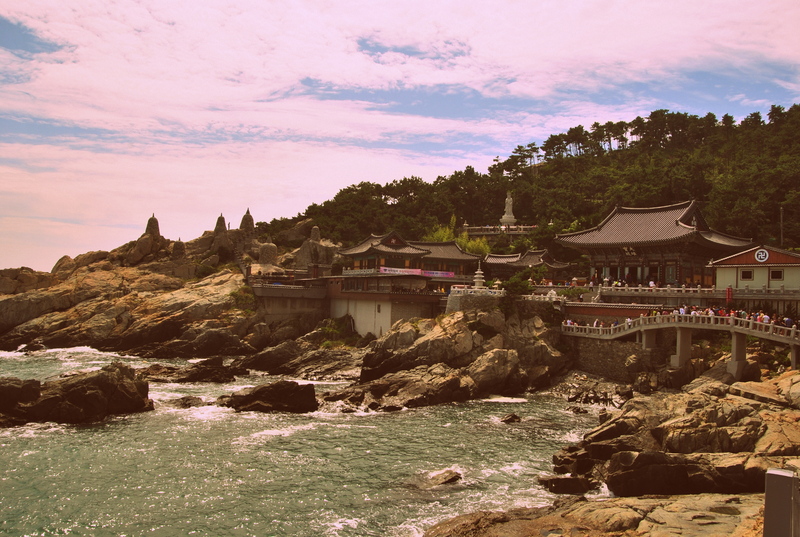 A 10-mins drive away from Haeundae beach is a beautiful temple. Stunning location, the view is just amazing. I’ve heard that there is a navy museum close by too, so that option is available too. It is much easier to get a cab there, cost around 6-7k each way. Works out to be quite cheap if a few people are going. Otherwise a public bus goes there too. The biggest spa is Asia spans over four floors, and offers a number of pools, saunas and an outdoor section. Korean spas are great and inexpensive, and I love them. Last entry is at 9pm though and it will set you back 14,000 won. Five floors of exhibition floor, catering for different tastes. Art exhibitions, sculpture park and an archive make this place quite memorable. I saw Pablo Picasso and Belorussian-born Malevich, need I say more? There also a few places that I had on my list, but didn’t get a chance to visit, but heard really good things about from people who have. An official venue for the BIFF. The design of the buildings is extraordinary and really distinguished. The main roof is covered with thousands of LED lights and looks pretty amazing if you ask me. There are three building for different uses – cinema, theater, musical stage, cafes, restaurants, bars. Cheap movies are on everyday and rumor has it that there are free movies on Tuesdays. 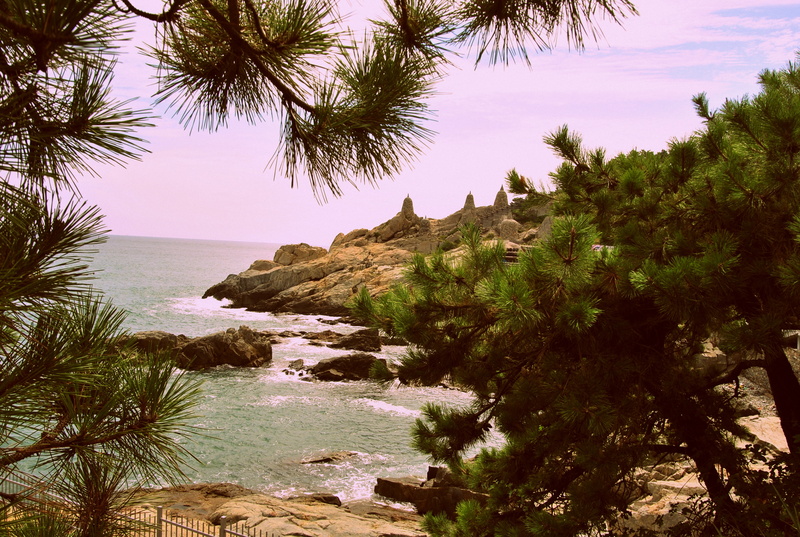 A beautiful backdrop just a short taxi drive away from Haeundae Beach. 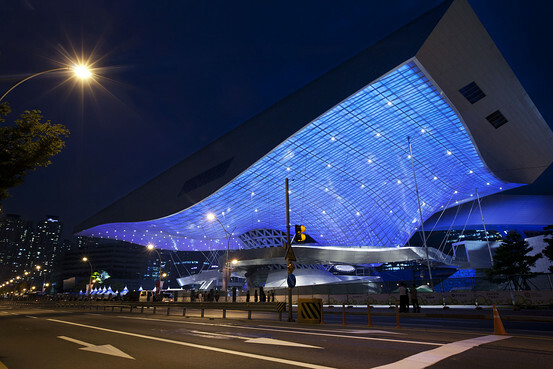 The largest department store in Korea spans over 14 floors, it is a home of standard services (i.e. shopping) as well as Spa Land, Multiplex cinema, book center, indoor gold practice and an ice ring. 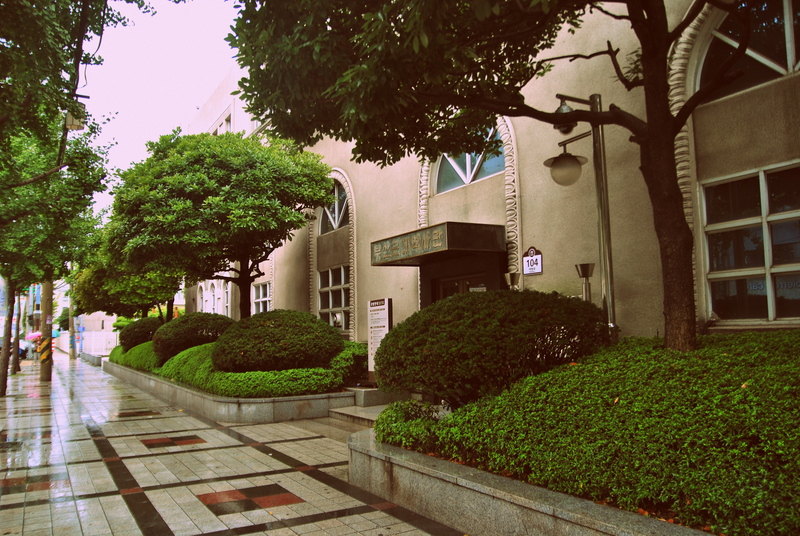 This museum consists of two exhibition halls. The museum is specialized just in photography. Oxygen generators are installed in each hall and so audience can see photographs with exhilarating air.